Understanding Islam – Part 34 (A Leader for a New Quran) – Wake Up! Wake Up! As much as we learn about Islam it appears to be asleep in the ages of time past, a time when Muhammad engaged his tribe (Quraish) and people, the Arab tribes of Mecca, in the ideology of Islam and a monotheistic belief. Allah became the focal god, Muhammad the Messenger. Muhammad’s attempts to change the polytheistic nature of Mecca was met with resistance, he labelled it ‘persecution’ and fled to Medina. There he established his training ground for retribution. He encouraged a body of followers to equip themselves, empowering them, in the name of Allah, to raid traders along essential trade routes in Asia Minor keeping the spoils for financing his objective. He forced conversions and used ethically questionable methods to convert peoples of Medina to his ideology of Islam. Many converted just to get in on the raiding and pillaging for the benefits enjoyed. Sura 8 deals with the spoils of plunder of non-Muslims. He was successful and his army was building, enjoying their strength and the personal gains from overpowering others in the name of Allah. He then took his army of raiders and brought them to Mecca so his vengeance, and revenge, against the people there, could be exercised. Using deceit, which is encouraged in the Quran, Muhammad arrived during the time of the agreed peaceful pilgrimage and succeeded in compelling the tribes and residents then in Mecca to his demands. He embraced the meteorite rock of Kaba as the symbol of only Islam, taking celebratory horseback rides around the structure. His methods continue along the battle lines drawn by the extremists, those who follow closely the writings made after Muhammad’s death. Islam is frozen in the 7th Century. All the world is now the extremist,s goal, ‘until all is for Allah’ their stated cause, America a focus, the West in general, and certainly Israel and the Jewish population. Oddly enough it was the Jews that first embraced Muhammad when he came to Medina, escaping Mecca for the trouble he alone created, and then he turned on them. It is his nature to befriend those that may trust him and then use their confidence to kill or destroy unless they fall in line with his demands – his ideology. there exists hatred (enmity towards) for Jews and Christians, especially, as People of the Book (Bible), as well as other non-Muslims. Such hatred will continue until all (the world) are for Allah. Peace is considered, but only if the specter of persecution of Muslims is not evident. Any persecution (judged by the claimant) justifies war (jihad). Justified war is to continue un-abated until all is for Allah. Freedom is denied.It is denied for Muslims. They are precluded from marrying outside their ideology under the threat of sever punishment. Conversions to other religions are forbidden under the penalty of death. Personal, studied, objective judgment is simply not allowed; the intelligence of humans is suppressed. Human rights and freedom of speech are expressions that are counter to the way Muslims are subjected under the tyrannical leadership of the Imams and political authorities. The Spiritual Laws of Sharia supercede the Temporal Laws of governance. There is to be no separation of State and Mosque. Know, in understanding what has been stated, there are more Muslims worldwide that do not live by the strict standards of the Quran. Called ‘moderates’ they have been classified as influenced by Western cultures, having become secular and not compliant with the norms of Islam. The presiding authorities in the Muslim countries would suggest the ‘moderates’ be contained, at least taught a lesson, so they may be more responsible as a Muslim and a believer in Islam. As as Strategy of Conquest many ‘moderates’ may be plants/spies (some may not even realize it) for establishing a base in non-Muslim areas and beginning the posturing process of developing a new foundation for Islam. (see: http://www.youtube.com/watch?v=RjBqyv-qf1M) This has been suggested in areas such as the UK, France, Germany (Berlin) and other European countries. Declaration of Human Rights for everyone, not just Muslims, of equality. There is a large ‘BUT’ and that is the ‘WHO’ would lead the way to such change. But who will lead the ‘moderates’, those not otherwise feeling the guilt of the submissionism of Islam, but the independence of being a human being. But who will have the courage to form a new Quran for the modern-day people of Islam. But who will outline, defend, and seek support for the ‘New Quran’ so its adoption becomes a reality. A peaceful solution may be possible, but who? History already informs us that more Muslims, probably ‘moderates’ or the more conservative, less belligerent, have died by the hands of the fundamental, or more extreme (adhering to the Old Quran) Islamists, than non-Muslims. It is from the ranks of modern-day Islam (not the 7th Century Version) and the Muslim population that their saviour must emerge and bring peace to the world, tolerance of other faiths and open borders to free trade and free travel. Needed is a most courageous leader and a most courageous body of supporters and followers. Talk of sacrifice, these persons who can succeed in the changes to form the ‘New Quran’ will discover martyrdom by the hands of those whose personal image and ideology is in a direct-connect with Muhammad and the life he lived 1400 years ago. We see it in the eyes of today’s ‘Terrorist’ – they fear the truth and defend the lies, the age-old rhetoric Muhammad used to establish his ideology. If there is a heart in Allah he will find a way to free Muslims from the shackles Muhammad has placed on them. If Allah has a heart we will free Muslims from the ignorance made possible by denying Muslims, especially in Muslim in concentrated areas, access to the truth in world events. Jews and Americans, the West, are hyped daily as enemies of Islam. But in truth the enemy lies within. Maybe that is the image that all Muslims attempt to suppress when they express outrage over drawings, images, cartoons, and depictions of the Prophet Muhammad. 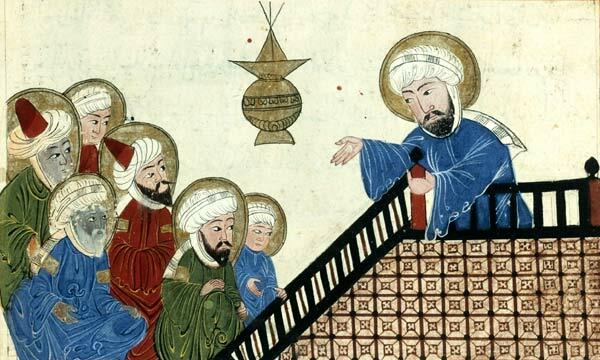 They do not want Muslims to see Muhammad for the person the rest of the world sees. Islam needs a leader that puts away the sword of Muhammad, places it in a museum for viewing, never to be used again. Jihad must become an inward struggle with religion and not an outward struggle with neighbors, regardless of their beliefs. Needed is the leader wanting peace in and with Israel, no nuclear aggression, to be trusted and find compassion for all humanity, men and women, Jew and Christian, Hindu and Buddhist, all people as equals worthy of respect and making personal choices that can be accepted. The world needs to see the image of such a leader expressing his desire for his people to build a bridge to a peaceful future where all can co-exist. Man must not be the judge; judgment is left to God. Man can follow his own path and make decisions that he feels will bring him honor on Judgment Day, and he must do so without taking or hampering the lives of others. How can hate be extracted from our bodies so we can restrain any distaste we have for those of unlike minds? It is possible. Prayers must be said daily for a world of peoples united by Hope, that Hope in Freedom and Liberty. That Hope needs to be found in the heart of Islam and a person or persons need to come forward to grow a ne religion based on a New Quran that all Muslims can find exciting, liberating and worth fighting for (without guns, knives, swords, coercion or war). The new Islam must be able to live shoulder to shoulder with Christian and Jews, secularists, and people of all beliefs. Let them all express and teach their religions and allow intelligent minds to choose their path to a life eternal, or a life that simply ends – their choice. Grace and Peace and may that leader find in his heart and soul the needed strength to rise up and lead 1.2 billion Muslims to peace with everyone.